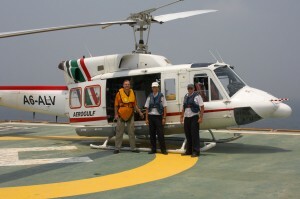 Argo Flares – Flare Aerial Inspection Survey, Remote Helicopter Flare Inspection. Remote Flare Tip Inspection / Helicopter FlareTip Inspection. Operators are finding it beneficial to undertake an aerial flare survey approximately 6 months prior to a planned shutdown (TAR). This allows enough time to prepare for the actual work-scope required. Some operators also use our Flare services once a month to gauge flare deterioration rates, on problematic installations (Remote Flare condition monitoring). Following our pre-flight brief with the photographer, in which we request specific areas to be covered, we also pass on any client requests. These may be to get a few shots of the flare support structure, flare deck covering or flaredeck panels. A set of Quality Photographs taken by a professional photographer (typically 20 – 25 photographs). If requested, the photographs can also be supplied digitally by CD, or in situations where photographs are required on an urgent basis selected photographs can be emailed. If required Argo Flares can also provide a detailed report on the condition of the flares, highlighting any possible areas of concern, along with likely consequences of any failure mode. Two return seats on a scheduled crew change flight (one for the photographer and one for the additional cabin crew to allow the aircraft to fly with its door open). An additional ½ hr between crew change-over for the flight (typical time required for a simple installation). Please download our offshore flare inspection brochure or contact us for additional information and an initial estimate of the costs and logistics of looking after your flare system.